Kami Kinard enjoys writing about the boyfriend quest more than she enjoyed experiencing it. A teaching artist on the SC Arts Commission s Roster of Approved Artists, she writes from Beaufort, South Carolina where she lives with her husband and two children. Please visit her online at: www.kamikinard.com." 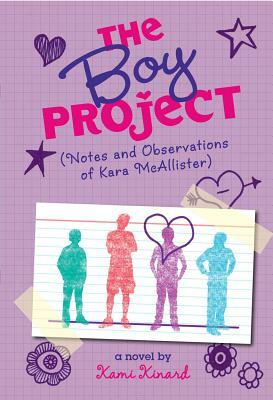 Looking for a boyfriend takes on a whole new meaning when 14-year-old Kara starts her research project. Kara, a self-proclaimed geek, decides to find a boyfriend using the scientific method. This initially involves covert observation of her subject: boys. She keeps detailed index cards, and the novel is decorated with her charts, graphs and lists. The project eventually becomes a science-fair project that also utilizes Facebook for a love survey. When her best friend Tabbi gets a boyfriend first, unfortunately with Kara\u2019s crush, it takes Kara some time to remember that she needs her best friend more than a she needs a boyfriend. This middle-school drama is hip to the moment, with break-up texting, kissing and popularity tug of wars. The boy obsession becomes tiresome, but Kara\u2019s irrepressible spirit, clever wit and introspection save this story from vapidity Kara\u2019s hilarious observations, as when she compares feigning happiness to the difficulty of fastening the, like, 15 hooks of her 87-year-old grandma\u2019s bra, keep it buoyant. As she becomes increasingly discerning, Kara realizes that being true to oneself is the coolest asset.